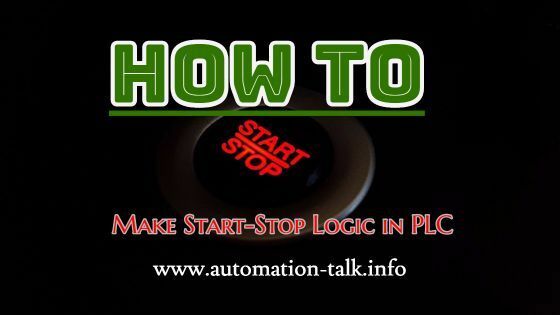 This tutorial will teach you how to use NO and NC for making start stop logic. For this we understand that you have basic knowledge of NO and NC. You can also learn Basic of PLC here. Subscribe to Automation-Talk by Email. To make start-stop logic you just have to write a simple program in PLC. In Electrical, it is possible to make start-stop logic with a NO start push button and NC stop push button, but in PLC you can make start-stop logic with any combination of start and stop push button. Before we begin, let fist understand what is the meaning of PB, NO, & NC. So, this is how you make start-stop login in PLC using the different NO-NC combination. If you are facing any issue, you can leave your comment below. Fateh Start and Stop logic is simple. What you want to know ? how to program for, if output 1 is on after 5 sec delay, next output 2 with delay, next output 3 should on with delay. when 3 is on, then 1 too should on and 2 must off. how to generate logic for that?? & thanku, above examples are helpful.